Social media marketing is now an over $7.50 billion industry. In fact, over 90% of marketers are using some form of social media to help promote their brands and connect with both current and potential markets! It’s impossible to over-estimate the importance that social media has on your sales. Recently, a study proved that over half of all buyers say that Facebook is their biggest influence when deciding whether or not to purchase a product or work with a brand. So, you know social media is important to your sales, branding, and even your sense of customer service. But how exactly does it offer you SEO benefits? We’ve all laughed at a viral meme or shared a post we found on a friend’s page. But did you know that social sharing is one of the main SEO benefits that social media can offer your brand? If someone sees something posted by your brand that they enjoy and shares it on their page, remember that all of their friends see it as well. Same goes with re-tweets, and even Instagram follows! A single share can drive tons of traffic to your website. Some SEO Experts even considers shared more powerful than building backlinks. More traffic = higher rankings in search engine results! Don’t just share photos of your favorite products. Also, share links to your website. Got a blog post you love? Share it. A new product page? Post it to your social media platforms! Keep in mind too, that clicks from social media give you organic clicks. This means you’ll rise even faster in the rankings. Pro Tip: Lots of brands are encouraging their social media followers to share postings on their timelines to qualify for contests or special discounts. Why not try it out for yourself? It’s a great way to help yourself and your customers at the same time! Yes, it’s true. You do not need fancy analytics to understand that social media brands carry weight with Google. So, making accounts on multiple social media platforms will help you to rise in the rankings. Instead of seeing your website, Facebook page, and then the page of your competitor, with multiple accounts, searchers will only see you! Always be sure though, that you’re frequently active on and updating your social media accounts. Leaving them dormant for too long could cause you to bump down a few notches. Make sure you’re posting a few times a day to see the SEO benefits of social media! 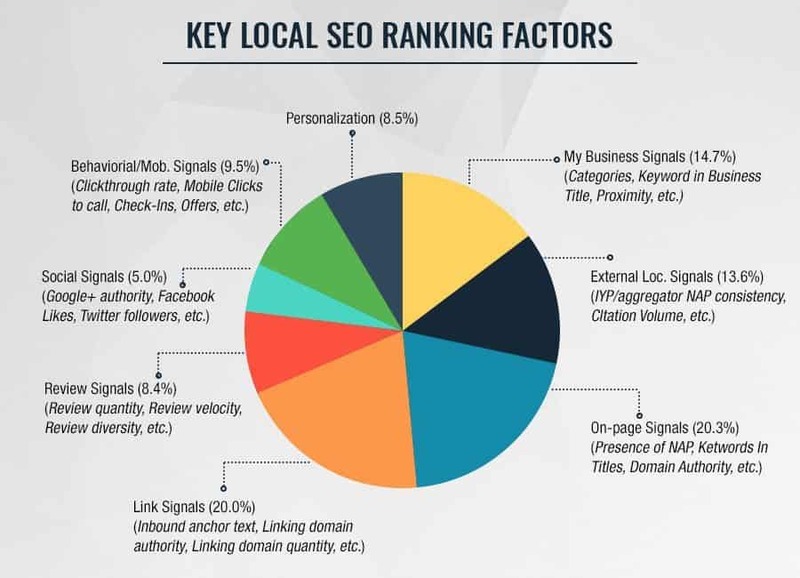 Your social media accounts can also give you enormous SEO benefits on a local level. Many social media platforms and websites filter search results by location. Encourage your customers to leave you reviews on sites like Yelp and even Google My Business. The more reviews you have, the higher you’ll fly in the rankings. Always be sure though, that you’re using the same contact information for all social media accounts. Check out my 53 Best SEO Tools and find the right tool to research citations. Incorrect or inconsistent information can cause you to fall in the rankings. These days, more and more people are looking for products and services online. You need to do everything you can to make sure that, when they type in the things you sell or provide, your name comes up first. Social media offers direct SEO benefits because being active on multiple platforms helps you to build your brand. Did you know Facebook ads are also a great way to engage new clients and build your brand? Think about it: the more people that know your brand’s name, the more likely they’ll be to type in your company’s name on search engines. When these search engines see that your brand is being searched for more often, you’ll rise in the rankings. This is because the search engines will see your brand as “more popular” than others. So, now that you know all the incredible things social media can do for your brand, how can you harness its power? First of all, do everything you can to get more followers. Put more keywords into your social media posts, follow people you think might be interested in your product, and get active on other industry pages and accounts. The more followers you have, the higher you’ll rank. Keep in mind that sometimes, Google can tell if you’ve bought followers, and will dock you in the rankings. Instead, always go for quality followers. Then, make sure you’re frequently updating your accounts. Aim to reach your followers morning, noon, and night to see the difference in your rankings. Keep in mind that the audience of Twitter is different from that of Instagram. In other words, if you’re using only the same content for all your platforms, you might not see as many SEO benefits. Instead, tailor at least some of your content for specific outlets. Don’t underestimate the power of live content! This is an excellent way to connect with your followers in real time, encourage people to click on your website, and even announce the launch of a new product. When you’re shooting live video, always encourage your followers to share your stream. This alone is great free lead generation. Finally, to boost traffic to your site using social media, consider doing a post with an influencer. An influencer is someone in your industry/field with a large social media following. Reach out to them about doing a post promoting your products or using your services. They’re seen as an authority in your field, so their followers will also trust your brand. Now that you’re aware of all the awesome things the right social media content can do for your brand, isn’t it time you got started? Or maybe hire a social media management company? Be honest though – how much time do you have to commit to your social media platforms during your business day? As a social media expert, I can help. Get in touch with me today to learn more about the incredible SEO and social marketing services I offer. Make this the year you get to the first page of search results!